We have had the best weekend so far. Nat has been in such a silly, snuggly, fun mood and we’ve just been having so much fun laughing and playing with her. After a week of what felt like non-stop committments and things to do every spare moment, it was nice to not have any pressing matters to deal with yesterday. Oh! And after Nat woke up at 6 am and I brought her to her room for what I assumed would be some family snuggles before we were up for the day, she fell back asleep, and so did I – and we slept until 8:30. I can’t even tell you the last time I slept until 8:30. It was glorious!! And then we lounged around, had some breakfast, played, and just had what I thought was a perfect day. I made and photographed a couple of things for the blog and got the kitchen cleaned while she napped and J went to work for a bit, and then after he got home we went to go eat and pick up a few things at the store. While we were out I realized, I don’t have to cook tonight!! It was really such an amazing day all around. Now, I could have done without the tornado watch and torrential downpours and ill-timed thunderstorms at bedtime, but…even with that my sweet pea was pretty cooperative and the day ended just as nicely as it began. I could really get used to weekends like that! 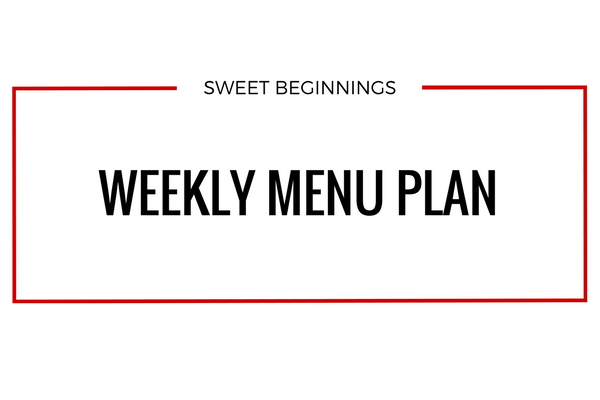 We had some variance in our weekly menu plan this past week, but I suspect we’ll stick this this week a bit better. I just have a feeling, ya know? Besides, I think I planned some good meals that will be easy to make, even if we get a late start on dinner. Just check out this weekly menu!